%VIRTUAL-SkimlinksPromo%George Osborne pledged to share the benefits of economic recovery with pensioners and savers today as he delivered his penultimate Budget before the general election. The Chancellor unveiled radical reforms to tax rules on retirement pots and new-style flexibile ISAs where people can save up to £15,000 without the Treasury taking a cut, and he pushed up the personal income tax allowance to £10,500 next year. Hailing the success of the coalition's austerity programme, Mr Osborne said UK plc would grow by a better than forecast 2.7% in 2014 and the government would be back in surplus by 2018-19. He also offered some crowd-pleasing items including scrapping the duty escalator on wine and spirits, a penny off a pint of beer, and freezing the "carbon floor" price in a bid to take £15 off consumers' energy bills. "The message from this Budget is: you have earned it; you have saved it; and this government is on your side, whether you're on a low or middle income, whether you're saving for your home, for your family or for your retirement," Mr Osborne told MPs. But Labour leader Ed Miliband responded: "The Chancellor spoke for nearly an hour but he did not mention one central fact: the working people of Britain are worse off under the Tories." There was disappointment for Tories who have been urging an increase in the higher tax rate threshold, after millions more people were dragged into paying 40p. The level at which the rate kicks in will rise below inflation next month to £41,865 - and then to £42,285 in 2015-16. The uplift in the personal allowance was in line with expectations, despite speculation that the Chancellor could opt to go further. 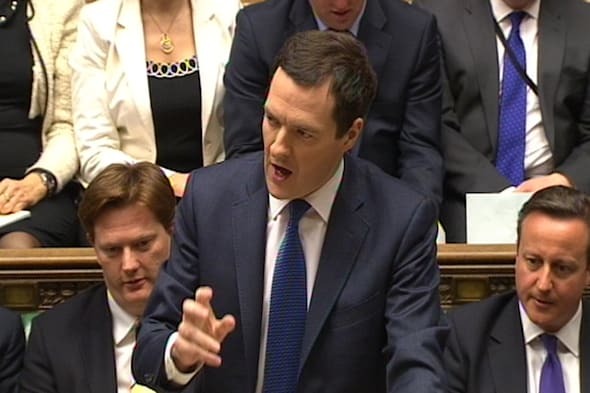 Mr Osborne said duty on bingo halls would be cut by more than anticipated - from 20p to 10p. But fixed odds betting terminals will be hit with 25% rates in recognition of their addictiveness to gamblers. Duty on Scotch Whisky and cider will be frozen, and inheritance tax will be waived when members of the emergency services who die in the line of duty. Investment allowances for small and medium sized businesses are being doubled to £500,000, one of a host of breaks for exporters and manufacturers. But Mr Osborne targeted most of his big measures at savers pensioners, with fundamental reforms of rules. Mr Osborne said people would be "trusted" with far more control over their pension pots, and no longer obliged to buy an annuity at low rates. Those approaching retirement will get free financial advice, and they will be able to draw down as much of their defined contribution fund as they want even if they are in line for relatively small incomes. Instead of being hit with punitive 55% tax on sums they extract from funds, they will instead pay normal tax rates. "People who have worked hard and saved hard all their lives, and done the right thing, should be trusted with their own finances." A new state-backed Pensioner Bond will also be launched to help people who have suffered low returns since interest rates were slashed to keep the wider economy afloat. Up to £10 billion of the bonds will be issued, with individuals able to save up to £10,000 with interest likely to be 2.8% on the one-year version and 4% if they lock in for three years. "That's much better than anything equivalent in the market today," he added. The cash and stocks elements of Isas will be merged into a larger tax-free vehicle, with savers now allowed to stash up to £15,000 in whatever form they want. The cap on Premium Bonds will also be lifted from £30,000 to £40,000 in June, and to £50,000 next year. In a final flourish, the Chancellor declared that the 10p starting rate for income from savings would be abolished. "It is complex to levy and it penalises low-income savers," he said. "We will almost double this zero-pence band to cover £5,000 of saving income. "One-and-a-half million low-income savers of all ages will benefit. Two-thirds of a million pensioners will be helped." Among measures to crack down on abuse of the tax system, the 15% rate of stamp duty for people who buy houses through a company will be extended to property worth between £500,000 and £2 million. If, like many Britons, you have failed to save the cash you need to maintain a comfortable standard of living in retirement, one option is to sell your home and downsize to a smaller property, using the money leftover to cover your living costs. If moving out of the family home is too much of a wrench, however, the good news is that equity release schemes allow you to stay in your house or flat while still using the equity built up in it to provide some extra cash. The downside of the schemes, which work a bit like mortgages, is that you may not have much left to pass on to any children or other relatives. But that's a small price to pay for a reasonable standard of living. For more information, try Age UK on 0800 169 6565. Choosing the right annuity can have a significant impact on your retirement income. And as with most pensions, you automatically have what's called an 'open-market option' (OMO), you can scour the market for the highest annuity rate. It is worth checking what your pension provider is offering first, though, as some companies offer guaranteed rates for existing customers that are likely to beat those available elsewhere. The Pensions Advisory Service on 0300 123 1047 is a good place to get some free advice. On retirement, most people convert their pension fund into a guaranteed income annuity that pays out the same amount every month for the rest of their lives. However, you can also choose an increasing annuity that pays out smaller amounts in the first few years but offers larger payments further down the line. This may prove a wise move if the rate of inflation remains at over 2%. It is now easier to work later in life because the "default retirement age" has been scrapped. People approaching retirement age and worrying about money can therefore choose to work for a few years longer - potentially transforming their financial situation. Other than the extra income from working, these people can look forward to higher state pensions, and higher annuity rates due to their greater age. They can also benefit from bigger tax allowances and the fact that they no longer have to pay National Insurance contributions. Check out this nidirect website for more details. You could get a much better rate with an impaired-life annuity if you have a medical condition that is likely to reduce your life expectancy. Incredibly, even snoring, which is a common symptom of Sleep Apnoea could have an impact. According to figures from MGM Advantage, a man with this condition could receive an extra £12,000 retirement income over the course of their retirement - or £571.44 extra money each year. Click here to find out more. To maximise your retirement income, it is vital to ensure that you are receiving all the benefits to which you are entitled. These include the basic State Pension, and in some cases, the additional State Pension. If you are on a low income, you could also qualify for the guaranteed element of Pension Credit, while those with some savings may get the savings element of this benefit. For more information about these and other benefits such as the Winter Fuel Payment, click here. Many older couples rely on the pension income of one person - often the man. Should that person die first, the other person can therefore be left in a difficult position financially. One way to prevent financial hardship for the surviving person is to take out a joint life annuity that will continue to pay out up to 67% of the original payments to the surviving partner should one of them die. The disadvantage of this approach, however, is that the rate you receive will be lower. Again, the Pensions Advisory Service on 0845 601 2923 is a useful first port of call if you are unsure what to do.